This church with a curious name (Visdomini comes from Vice Domino, a church administrator) originally stood in the way of the Duomo, and had to be knocked down in 1363 and rebuilt here. In the late 1500s it was given its simple white facade by Ammannati. Filippino Lippi was buried here, as the plaque here reads. Inside you'll find ceiling frescoes attributed to Spinello Arentino in the right chapel, a Fall of Satan over the crossing by Niccolò Lapi, and on the right wall, the church's masterpiece, Pontormo's Pala Pucci (or Sacra Conversazione). The painting was recently cleaned to bring back some of the bold colours of his utterly compelling Deposition in Santa Felicità, but the more you look at it, the more curious it becomes. For once St Joseph gets to held baby Jesus, but just at what are the Madonna and St John the Baptist pointing? Both are smiling; baby Jesus and the angel on the right, who seem to have the same face, seem to be laughing at whatever it might be; Joseph and the old saint with a book look alarmed. 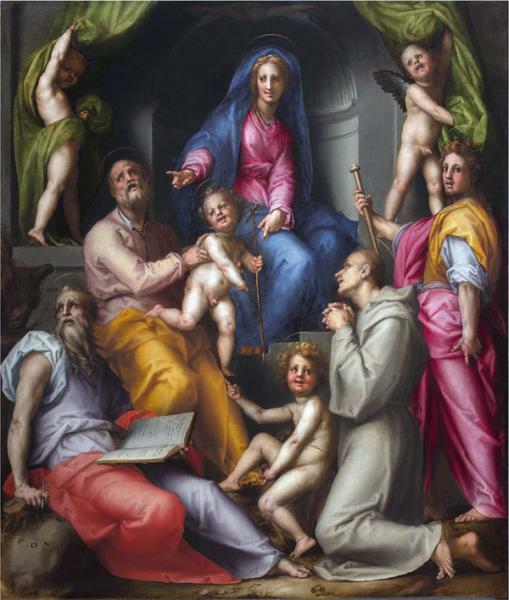 Vasari declared it was the best work 'by this very rare painter'; it's certainly one of his most conventional. But you can't help but wondering: what's really going on?